Hard to believe but we are already into September. It’s still hot, really hot, where I live but soon the leaves will start to change and the gift giving season will be upon us. Homemade gifts are gifts from the heart. 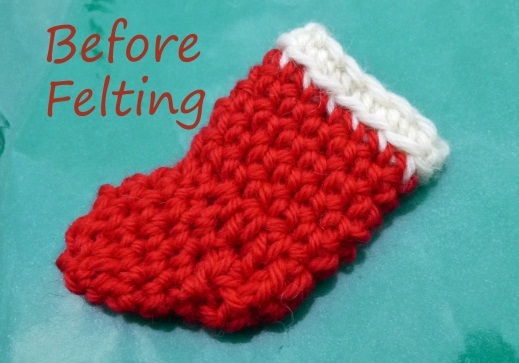 Combining the gift giving season with crochet is something we crafters can look forward to all year. And if you enjoy repurposing as much as you enjoy crochet then I have a question for you. What do you get when you combine an old wool sweater, a washing machine and a little imagination? A few years ago I discovered felting (I believe it is called “fulling” when a wool item is already made and then fluffed up but it’s often referred to as “felting”). I had a beautiful partial wool sweater that I just could not wear. Even with a cotton turtleneck underneath, I was bothered by the itchy wool. But I loved the colors in the sweater so I held onto it. One day I decided I wanted a tea cozy. Rather than purchase one, I felted my sweater in the washer. This created a really nice thick fabric. I cut it to shape, sewed the two pieces together and lined it with an old dish towel on the inside to keep the wool fuzzies from getting in my drinks. Now I have an adorable tea cozy and enjoy my beautiful sweater every day! Felting is fun and easy and can repurpose just about any wool fabric into something new. So, what does this have to do with crocheting? Well, you can make a fantastic Ice Scraper Mitt by felting an old sweater, cut two pieces to size, embellish with an adorable crocheted snowflake, sew together and voilà! , you have a beautiful handmade gift. I use felted wool sweaters to back my Pizza! Pizza! hot pads to protect my counter tops from hot items. Crocheted coasters can be backed to add additional protection from condensation. Or cut appliques from the fabric and decorate crochet hats or purses. Well, it’s easy. Place your item to be felted in your washer. Turn it on and relax! That is essentially it. It’s best to place the item in a mesh delicates/lingerie bag and wash with your towels, sheets or other items you would normally was in hot. You can also use your cold cycle if you only wash in cold as the agitation of the items in the washer will also felt the fabric. After ten minutes or so, check and see if you have the desired effect. If not, keep it in until you do. Lay your item out to air dry. If you have a front load washer, never fear. Just use the shortest cycle as you will get to a point where you won’t be able to open the door to check on your fabric. 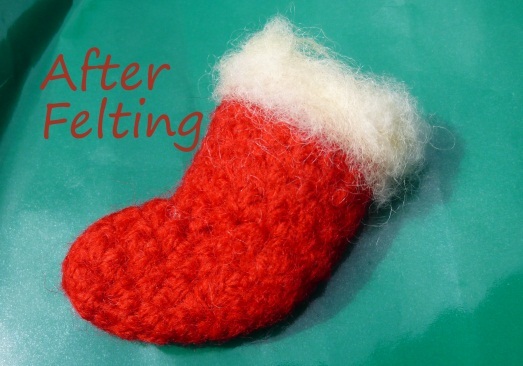 You may need to run it through a couple of cycles to get the desired amount of felting. Felting is fun but remember, once the items has felted (shrunk) you cannot undo it. Take your time, check your item a couple of times during the wash cycle and start with something small that would be OK if it didn’t come out perfect.  Superwash wool has been specially treated to NOT felt.  You CANNOT go backwards, so go slowly! This entry was posted in Eco Crafting; Reduce, Reuse, Recycle, Uncategorized and tagged craft, crochet, felting, Gifts, recycle, upcycle. Bookmark the permalink.